Given the current weather, I felt it appropriate to give you a few fun facts about snow! According to the Guinness Book of World Records, on this date in 1887 the largest snowflake ever observed fell in Fort Keogh, Montana. Supposedly this snowflake was 15 inches wide and 8 inches thick! Not surprisingly there aren’t any photographs of this giant snowflake, so basically we’re just taking the word of the rancher who claims he found this monster. South Dakota has some strange weather due to the Chinooks, and Rapid City (about 45 min from Spearfish) holds the record for the fastest temperature drop ever recorded. On January 22, 1943, the same day as the strange weather in Spearfish above, the temperature plummeted 27°C (47°F) in 5 minutes from 16°C (60°F) to -11°C (13°F), and this set the record for fastest drop in temperature ever recorded. Between July 1, 1998 and June 30, 1999, 29.0 meters, (1140 in) of snow fell on Mount Baker which is located in Washington State, United States. When the Mt. Baker Ski Area reported the figure it was investigated by the National Climate Extremes Committee and they voted unanimously to accept the number. The previous record was 1,122 inches on Mt. Rainer (150 miles south of Mt. Baker) in 1971. The Pacific Northwest has large quantities of snowfall in the mountains and that is for a few reasons. Seattle has a well-earned reputation for raining often, and when all of the moisture-filled clouds from the Pacific hit the mountains they begin to dump their precipitation on the slopes. Seattle is at a low elevation so it is frequently too warm for snow, but it is often below freezing at elevations higher than 4,000 feet which leads to the high snowfall in the mountains. Snowflakes form when atmospheric water is cooled below its freezing point by either an invasion of cold air, or a sudden updraft into cooler elevations. The water enters a super-cooled state and snowflake formation takes place upon air-borne microscopic dust particles acting as nuclei for condensation. As snow crystals form they take on a hexagonal shape with an infinite number of variations. The temperature at which a crystal forms, and to a lesser extent the humidity of the air, determine the basic shape. The many things that happen to snow crystals as they fall, such as collisions, partial melting and colliding with water drops that freeze to them, create even more shapes. Irregular crystals with no easily identifiable form or a combination of more than one form are the most common, and only 1 per cent of flakes are thought to be symmetrical. 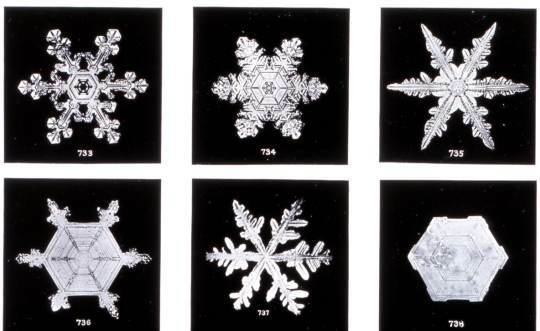 Snow crystals are six-sided because of the shape of the water molecule which consists of two atoms of hydrogen and one atom of oxygen. This construction is formed in the shape of a triangle with three equal sides. When crystallisation takes place, each new ice crystal bud is formed at an angle of 60 degrees from the hub or apex of the triangle. Continuing this process, the hexagon is formed when six of these molecular triangles are completed and this becomes the framework for further growth. Take 9,000,000 pounds of snow, two 4 foot wreathes to use as eyes, 6 feet of chicken wire and muslin for the carrot nose, 6 automobile tires as the mouth, a 20 foot fleece hat, a 120 foot fleece scarf, 3 more tires for the buttons and two 10 foot trees for the arms, assemble, and you have the world’s largest snowman. The snowman went by the name of Angus and was built in Bethel, Maine in 1999. He officially melted on June 10, 1999. Angus was a mountain of a snowman, measuring 113 feet 7 inches tall. 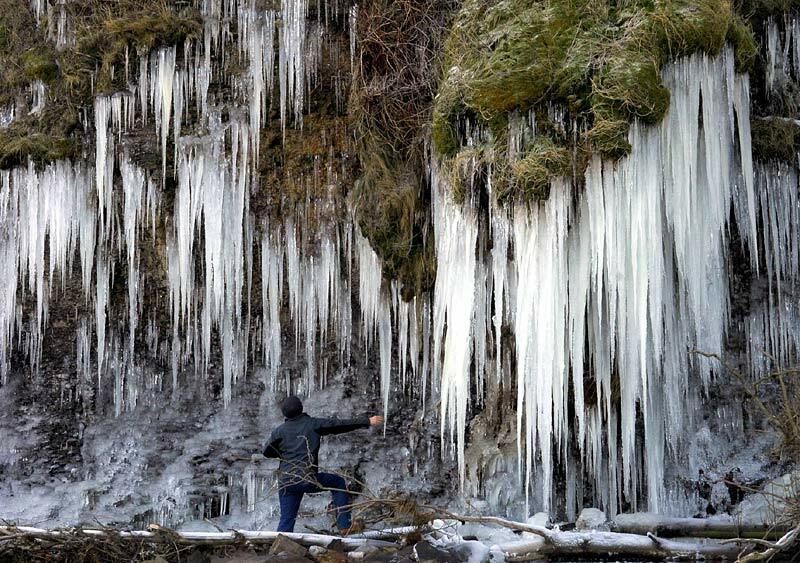 I couldn’t find any definite answers to what the longest icicle. There is a 100 ft Icicle that is being inspected as we speak but no definites yet. But here are a few pictures of some really big ones! ✲ 7) Most snow angels in one place. On March 28, 2007, Guinness World Records confirmed that North Dakota holds the world record for the most snow angels made simultaneously in one place. The record breaking event occurred February 17, 2007 when 8,962 snow angels were created by people waving their arms while lying in the snow covering the state Capitol grounds in Bismarck. NOW to warm you up, here is a fun fact about the largest cup of hot chocolate! The giant mug was filled with 487 gallons of hot chocolate, covered with bags of marshmallows and heated to a perfect temperature of 120 degrees. Between 6,000 and 10,000 cups of delicious hot chocolate were distributed to passers-by, for free. It seems hot chocolate is one of the best ways to stock up on vitamin-D, during winter. Who knew?